Club-Mate is made from the extract of yerba-mate, a plant indigenous to South America, which made its way to Europe following a wave of German migration. Why someone turned yerba mate into a soda is a bona fide mystery, but we do know that Club-Mate was introduced at an exhibition in 1924 under the name Sekt-Bronte. Since 1994, however, the drink has been produced at the small, family-owned Loscher Brewery in Münchsteinach, a Bavarian town with a population of twelve hundred, after the original brewer sold the family the license to the recipe. Though only the original blend is somewhat readily available in the U.S., Club-Mate has a few lesser-known siblings: a limited Winter Edition that’s spiced with cinnamon and orange, the caffeine-free Lapacho, and Club-Mate Cola, which is made with yerba-mate, kola nut, tea, and coffee, yet tastes shockingly Coke-like; it reminds me of Red Bull Cola, whose short life in the U.S. was only three years long. The population being charmed by Club-Mate doesn’t drink soda with any regularity — or at least, they feel shame if they do — and straight-up energy drinks are the domain of the very young and/or douchey. Its sugar content isn’t too high; there’s no high-fructose corn syrup; and right there in its name is a tea with hippie health cachet — but it isn’t too hippie, as evidenced by its popularity in the cold fields of computers and electronic music. While at first its earthiness and gentle sweetness are a bit jarring, it is possible to adapt, and the smooth alertness it grants proves worth the initial weirdness. After becoming popular in the German hacker community in the mid-to-late nineties, Club Mate began to spread outside of Germany through hacker conferences, eventually becoming the conscientious coder’s Mountain Dew and a staple in the electronic-music scene. The 2600, a hacker collective based on Long Island, began distributing it to individuals in the U.S. in 2008 at an event called The Last Hope, and was for years the only way to get it in the U.S. — either through their eponymous quarterly magazine or old-school website. The first bar ever to sell Club Mate on U.S. soil, Bossa Nova Civic Club in Bushwick, serves it with vodka for eleven dollars — a more artisanal Red Bull and vodka. You have to drink down to the “sweet spot,” the bartender told me, right underneath the label on the neck of the bottle. I did, and he filled it back up with vodka, the carbonated tea bubbling up and over as it hit. He added more vodka, then I returned to my table to drink it with the friends whom I’d roped into trying it with me. After the initial excitement wore off, we each sipped at our bottles slowly — not disgusted, but not pleased either. It wasn’t so novel for everyone else in the bar, almost all of whom were drinking the lager-colored liquid. Matthew Sanders, who runs Club-Mate’s USA distribution, says one of his worries in taking it on was that though everyone at Bossa Nova likes it, but he didn’t know whether this would necessarily translate into wide appeal. “People at Bossa Nova also like to do drugs,” he said, by way of explanation. Sanders has been running Club-Mate USA in Brooklyn for about a year now, which explains its creeping spread throughout the borough. He approached the head of The 2600, Emmanuel Goldstein, about a partnership, and now runs wholesale and resale distribution, while The 2600 still sells directly to individual customers. Sanders employs a combination of traditional beverage distributors and start-ups to move product. Most of it is kept in a warehouse near the L train in the deep outskirts of Bushwick, and delivery is free to stores in the greater NYC area, New Jersey, Massachusetts, Connecticut, Delaware, Maryland, and D.C.
Outside of New York City — where Trans Pecos in Ridgewood sells it for eight (1/3 liter), nine (1/2 liter) and ten (1/3 liter with booze) dollars a bottle — Club-Mate is mostly widely available in Austin, Texas. Beyond that, it’s scattered among major cities, with only four places for purchase in the whole of California. 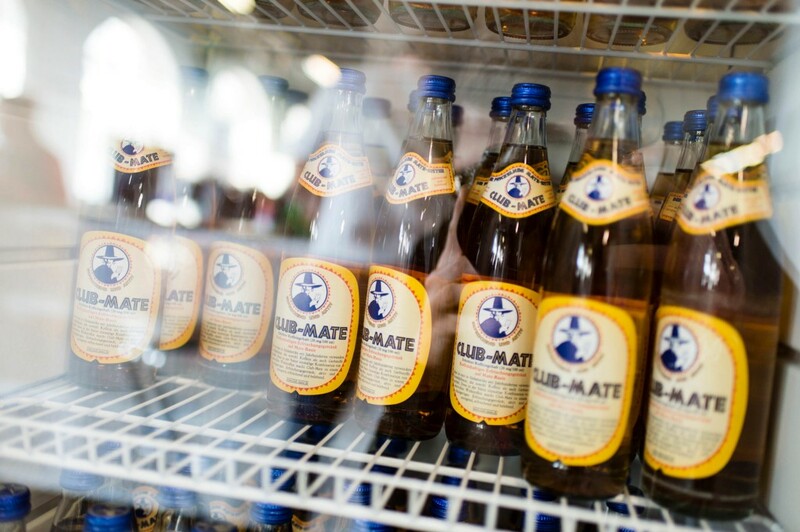 The insular family behind Club Mate isn’t interested in deals for domestic bottling or changing the label at all, making the possibility of the drink’s growth beyond niche tech and music communities, where it is renowned for its ability to power all-nighters. The West Coast is the next frontier, Sanders says, because there’s music in L.A. and tech in San Francisco; heavy glass bottles of an unknown beverage aren’t the easiest sell, so he doesn’t see it reaching the middle of the country in a major way for at least two years. As the label tells you, one gets used to it. But the next time I ended up at Bossa Nova Civic Club, I ordered a whiskey and soda. Correction: The price of Club-Mate at Trans Pecos was incorrect. It has been updated.